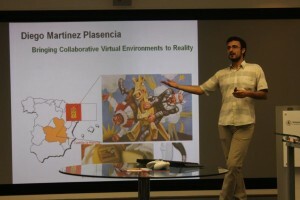 On Thursday 24th June THINKlab hosted a talk from Dr Diego Martinez Plasencia, Research Associate in Human-Computer Interaction, 3D Graphics at University of Bristol. His presentation entitled ‘Non-Solid diffusers: Bringing CVE’s to reality’ explored formats for non intrusive virtual reality. Back in 1965, Ivan Sutherland proposed his vision of the Ultimate Display . Such display would create virtual objects that were totally undistinguishable from their real counterparts (“the handcuffs displayed […] would be confining, and a bullet […] would be fatal”). This vision was the seed for research in the fields of 3D displays, Virtual Reality (VR) and Augmented Reality (AR). Recent market analyses foresee a bright future for these technologies, with companies like Samsung or Sony competing for a dominating position on this rising market. This comes after years of improvement in most technical aspects of VR. 3D sensing of user’s movements and interactions no longer require data-gloves or sensors (e.g. 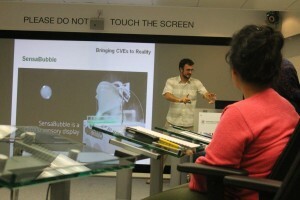 Kinect, Leap), and solutions have been proposed to produce mid-air tactile feedback on the user’s bare hands. 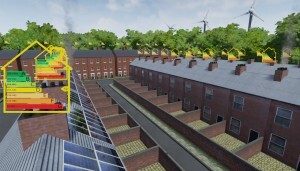 Although similar advances (i.e. costs, quality) have occurred for Head Mounted Devices (HMDs), they still cover user’s faces encumbering other daily tasks (e.g. office work) and preventing eye-contact and social interaction with other people (e.g. co-workers). Actually, social and aesthetic factors are considered the major risks to the eventual user’s acceptance and success of VR technology. This enforced isolation also contrasts with the emerging concept of the Internet of Things (IoT). While this concept aims to create an inter-connected world where technology seamlessly pledges and anticipates our needs, VR remains stuck in the same formats proposed 50 years ago. In this talk Dr Diego Martinez Plasencia summarize his efforts during the last years to come up with formats for non intrusive VR. He describe several systems created to support 3D interaction and collaboration in contexts of use where traditional VR formats fail to apply (e.g. face to face interaction, meetings, mobile contexts) and described the potential of non-solid diffuser displays to achieve this vision.